Hi Friends: Here's my last project showcasing the release of the new Tiki Hawaiian Vacation stamp set from JessicaLynnOriginal stamps. This stamp set is available with free shipping until official launch date on Saturday, March 18, 2017. Thanks for joining us for the launch of this stamp set. Hope you come join us for the launch and that you have a great St. Patrick's Day! Stamp the images onto smooth white cardstock with Memento black ink and color with Spectrum Noir markers. Fussy cut the images and add Glossy Accents to the beaks, and Glossy Accents with ultra-fine glitter to the fire in the torches and flames on Brentwood. Make the box card using the instructions from Split Coast Stampers, using the Sunsplashed papers as accents - ink edges of all papers. Add the Brentwood Owl twirling fire to the front flap using foam dots. 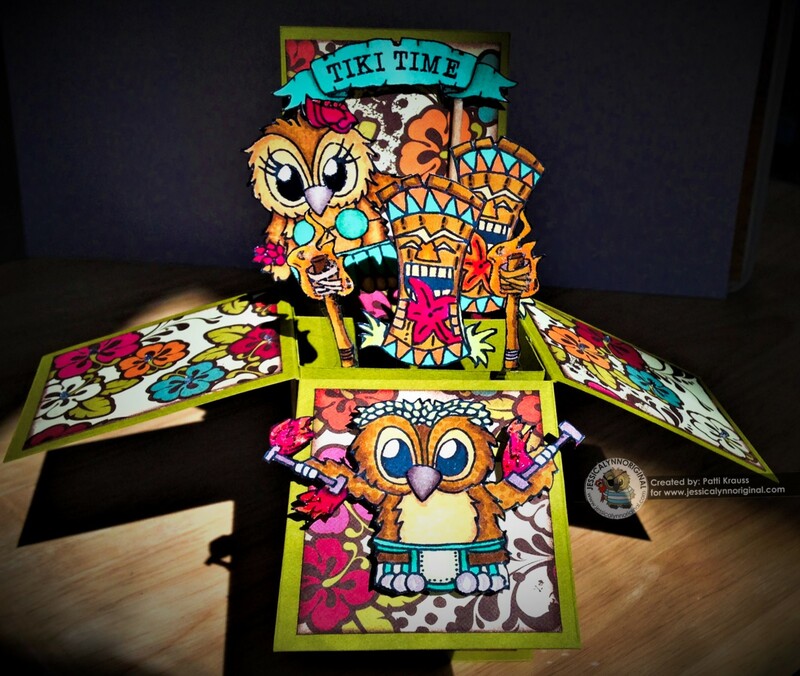 Glue the Tiki Time banner to 2 toothpicks and glue them to the back flap of the box card. For the rest of the images (female Brentwood, 2 Tiki torches and 2 Tikis, glue them to strips of transparency or clear plastic, then stagger them in the center strips of the box card. Finish with some gems in the flowers on the remaining 2 flaps of the card. Enjoy!